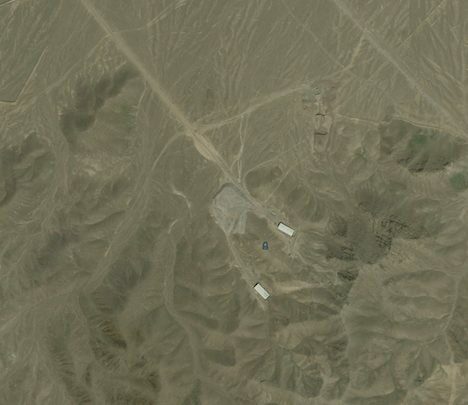 During the North American day yesterday ISIS chimed in with its best guess (PDF) for where Iran’s newly declared underground nuclear fuel enrichment plant is situated — two guesses, in fact. One of them is the same as the location identified in the previous post here on Ogle Earth as a likely candidate for the site. But ISIS also identifies another possible location further to the east. 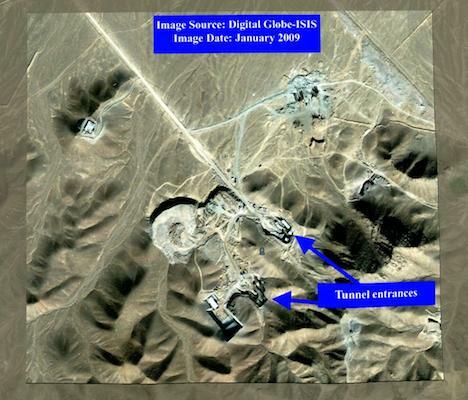 ISIS has the benefit of very recent imagery it commissioned, taken by DigitalGlobe — August 2009 for the already-identified candidate, and January 2009 for the new candidate. The new candidate in particular shows much development work in the intervening four years between when the base imagery in Google Earth was taken and the DigitalGlobe imagery acquired in 2009. The other candidate, to the west, shows little outward change in the intervening four years. Based on the 2009 imagery, my inexpert opinion now favors the new candidate identified by ISIS. ISIS’s findings are in PDF format, so I took the images therein and positioned them as overlays in Google Earth. Here they are available as a KMZ download. Play with the opacity slider in the sidebar to switch between 2009 and 2005.